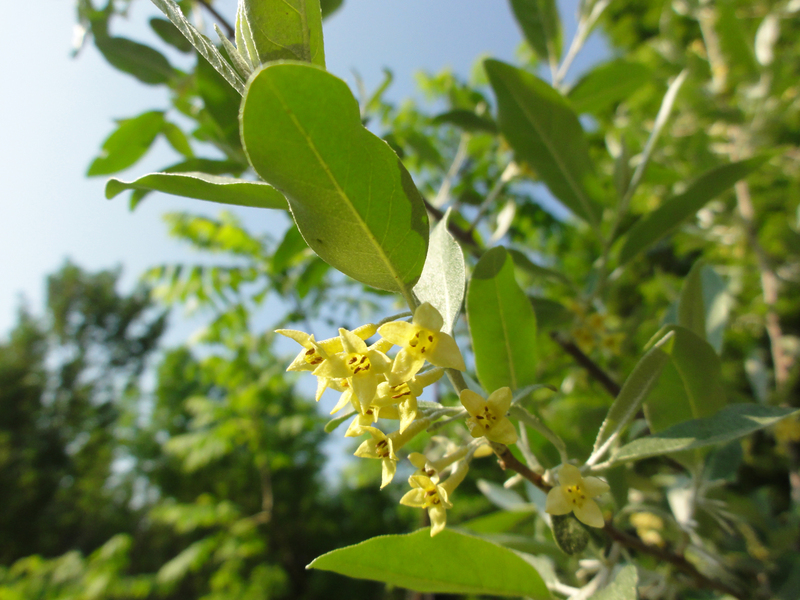 Autumn olive (Elaeagnus umbellata) has the distinction of being the most invasive plant at the conservation area, as ranked by the New York Invasive Species Clearinghouse Non-Native Plant Species Invasiveness Assessment. It is quite common in the old fields of the Federal Farm area, but far from being one of the most prevalent species. It seems to be somewhat more controllable at this point than a number of the plants ranked lower on the invasiveness list, but it is still a major concern. Autumn olive is a native of eastern Asia that has been widely promoted in the past for its benefits as a wildlife-habitat and erosion-control plant in North America. However, it has proved to to be way too aggressive and dominates native plants with its dense shade and ability to reproduce in poor soils, with prolific seed production (up to 200,000 seeds per year). Cutting and burning are not considered effective ways to remove autumn olive. Pulling and chemical application are recommended instead. But our control method so far has been limited to cutting (and some pulling of smaller plants using a weed wrench), and rabbits and mice seem to help control the resprouts to a minimal extent by eating their bark.